Home Blog Which fabric to choose for the sofa for your dog or cat? 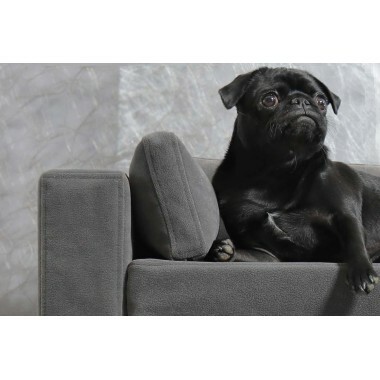 Home > Home Blog Which fabric to choose for the sofa for your dog or cat? The material of your couch for dogs and cats is a very important criterion, you have to ask the same questions as when you choose your sofa, with the understanding that a pet climbs on the couch with its paws and does not understand that they should be clean first. The texture should be soft, comfortable and aesthetic. But also resistant to claws possible teeth, it not attract hair, easy clean. It is imperative to choose a machine washable fabric. which is a treatment carried out on the fabric for a very simple cleaning with water and liquid soap. This is very convenient and also helps to preserve the longevity of the appearance of the fabric. The colors are also very important so that they can easily adapt to your design and that they do not attract too much hair or dirt. Choose trendy colors that blend easily with other colors. There are no miracles, the ideal material does not exist. Each of them has its advantages and disadvantages - it is better to think carefully about all these points before making your choice because even if the bed of your companion is initially a little more expensive, in the end you will find yourself spending way less time maintaining it and it will last much longer – saving you from buying a bed regularly.